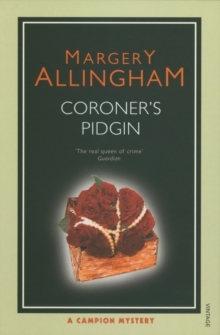 Margery Allingham was a contemporary of Agatha Christie and Dorothy L Sayers during the 'golden age' of detective fiction and I read lots of her books as a teenager, although I don't think I'd read Coroner's Pidgin before. It's one of Allingham's later books, taking place towards the end of the Second World War. Her detective hero, Albert Campion, has been overseas for most of the war but has returned briefly to his flat at Piccadilly simply to wash and change before catching a train for a mysteriously urgent but unspecified reason not revealed until the end of the novel. While he's there, he's suddenly interrupted by his servant Lugg and Lady Carados, the dowager of a local aristocratic family, carrying the dead body of a woman into Campion's bedroom. Who is this unfortunate victim, and how did she die? There's a great deal of wit in Margery Allingham's writing, far more than you'll find in most crime fiction of her period, and although Campion is, like Lord Peter Wimsey, a maverick aristocrat with a seemingly limitless supply of leisure time, I find him far more likeable and entertaining as a character. Campion, thankfully, lacks Wimsey's snobbery (intellectual and otherwise) and appears far more at ease in the company of people outside his social class. His relationship with former burglar Lugg is more that of a pair of old friends than master and servant and he enjoys something of a love-hate relationship with his old sparring partner Inspector Oates of Scotland Yard. That's not to say that this isn't, essentially, a book about ridiculous posh people - that is in fact exactly what it is. However, one thing I found interesting about this book was the way that Allingham explores the effects of the war on the characters and their status. The dead woman was one of a group of 'bright young things' whose way of life has effectively been curtailed by war. Lady Carados and cockney servant Lugg, a former burglar, are volunteer fire wardens together with equal status. Lord Carados is now an RAF officer whose equally well-to-do fiancee's head has been turned by an American GI. Campion himself, it's heavily hinted, has had his former career as a sort of gentleman adventurer curtailed by a stint working as a spy. The frivolous parties and society gossip that once occupied the Carados family and their circle of friends are now very much over, their favourite exclusive restaurants and glittering parties have been hit by either bombs or rationing, their country homes are being requisitioned and there's a strong sense that things will never quite be the same for these people again. In terms of plot this is a straightforward who (and why) dunnit, with multiple suspects and various potential motives, although in common with a lot of Allingham's novels it's as much an adventure story as a mystery and the reader isn't really given enough clues to have a chance of working out who the murderer is for themselves, so if you treat your detective stories as puzzles to be solved, you might find this tiresome. I generally don't, so I was happy to enjoy the somewhat improbable plot and eccentric characters and to be reminded of just how good Allingham really is. *A note for Americans: apparently this book was published in the US under the title Pearls Before Swine. I've no idea why.